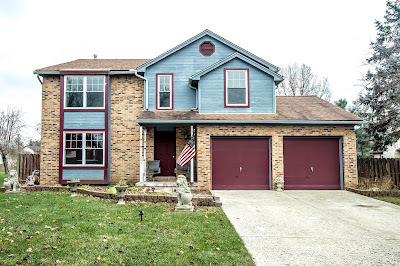 YOU’LL LOVE THIS HOME IN HUNTERS RIDGE! Filled with upgrades on a beautiful lot. Enter through the recently renovated front porch. New flooring and paint throughout the interior. Kitchen boasts tons of cabinets and eating space. Sunken Great Room with vaulted ceiling and woodburning fireplace with new porcelain surround. Atrium door to outdoor patio with large fenced yard. Upper level features 3 Bedrooms and 2 Full Baths. Full Bath is completely updated with granite countertops, marbled tile shower, porcelain floors, new backsplash, lighting, trim & medicine cabinets! 2 car garage has new ceiling, board strips and insulation! Close to shopping, schools, park and pool! Too many updates to list, do not wait! Over 2,100 SF! 3 BRs and 2.5 Baths. Gahanna Jefferson schools. Only $274,900! Call DeLena today!